Hey! A couple days ago YSL Baby Doll joined my perfume collection! It's actually quite an old perfume and difficult to find in stores, but still available online. The bottle reminds me a little bit of YSL's Parisienne, don't you think? "Flirty, fun, forever young… a happy-go-lucky fragrance that lives in the moment. Like a top spinning, the opening accord amuses with newly ripened grapefruit, then teases with witty turns of wild rose and spicy red currant. The base notes that follow--cedar, grenadine and new peach--linger momentarily, only to whirl anew. 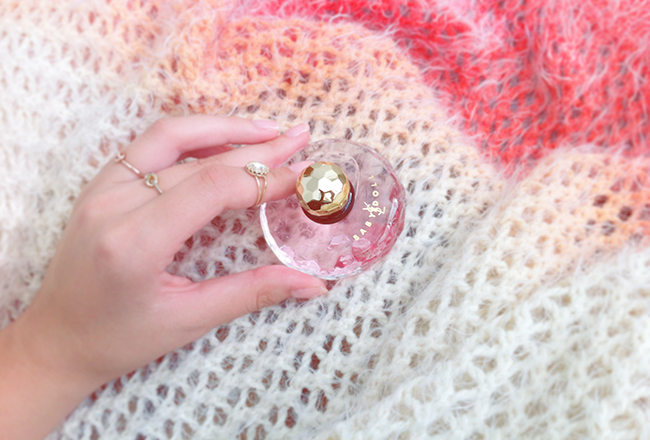 In a faceted crystal flacon reminiscent of a spinning top." Baby Doll is usually described as a light and sweet scent, but I have to say I think it's quite a heavy scent that I would wear for going out at night. It smells really fresh, clean and floral, but it's still a heavy scent, something similar to Miss Dior Cherie. great post. so pretty! would you like to follow eachother? I love this bottle and I love your rings!!! Especailly the midi ring!! Wow love the bottle ! So lovely ! I'm in blog heaven right now.